David Hewitt (MA, PhD, FEA, FRSE) is Professor in Scottish Literature. He is editor-in-chief of the Edinburgh Edition of the Waverley Novels, the first scholarly edition of Scott's fiction, which is being published in thirty volumes by Edinburgh University Press, and which is due for completion in 2006. The Edition has revolutionised ideas of Scott and his achievement and has generated, and continues to generate, many exciting ideas and opportunities for postgraduate research. Professor Hewitt heads with Dr Alison Lumsden the Walter Scott Research Centre, which exists to conduct and to promote research into Scott and his works, his intellectual context, and the ways in which his work was used by other writers, other arts, business and politics, particularly in the nineteenth century. Its interests are interdisciplinary and its scope is international. 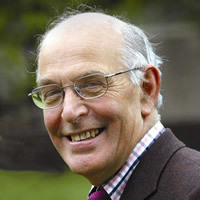 Professor Hewitt has wide interests in Enlightenment, Romantic and Scottish literature, and particularly in Burns, Scott and Byron, as well as Scottish language, and in textual and bibliographical research. On completing the Edition he will embark on an AHRC-supported project with Dr Barbara Fennell to investigate the political implications of the representation of dialect speech in Scotland and Ireland 1700-1900. He has supervised many PhD theses on a range of authors including Jane Austen, James Beattie, Robert Burns, Oliver Goldsmith, James Hogg, J. G. Lockhart, and Walter Scott. He will welcome further enquiries.